As you may have seen in our last Ecua Update, we are lucky to welcome Stephanie Allen as the newest member of our staff. She started as our new Program Manager earlier this year. Stephanie originally heard about Starfish through a year of Service with Rostro de Cristo, a Catholic volunteer program that invites young adults practice a ministry of presence within marginalized communities in Ecuador. While there, she met Beth, one of our co-directors and co-founders. Before starting at Starfish, Stephanie spent 2+ years as the Director of Volunteer Programs and Medical Outreach at Make-A-Wish New Hampshire and had spent a few months working in intercultural exchange in Cuenca, Ecuador. Stephanie agreed to a speed round of “favorites” questions to help us get to know her better. I love this quote as a reminder that everything that we do, from the big to the small, can have a positive impact on those around us if we act intentionally and give freely of ourselves. Reading, hiking, traveling to and exploring new places, and spending quality time with my family and friends. Driving around and exploring the beauty of New Hampshire with my mom, a hammock in Ecuador on a lazy Sunday, anywhere where I am surrounded by good company! Puzzles – number, word, jigsaw – I like them all! Guest Bloggers Alexis and Itaty share the success of their year-end Starfish service project. Our project was to repair a part of the playing field at the Foundation in order to benefit the Foundation members. Scholars, staff, and volunteers benefit from the use of the benches that will be available for any event at the Foundation. To be involved in a team project is not easy at all, and there have been many inconveniences with the distribution of duties, but this project helps us learn to work together and problem solve – valuable skills for the future! It also helped us gain practical skills and and that we can use our ideas to make the Foundation even better in the future. Overall, we managed to have good teamwork and we achieved our project objectives, which can be summarized as: “Fix up the Foundation playing field and the area around the playing field”. Together we were able to build wooden benches at the ends of the Starfish Foundation playing field. In order to raise funds, we organized movie nights. Even though we could not raise all the funds necessary for our project, the Starfish Foundation helped us financially to buy wooden boards, sticks, nails, etc. We also had help from the therapeutic group, director and administration of the Starfish Foundation, and we are very grateful for their support and collaboration. If we were able to do this project over, we would plan additional fundraising activities, in order to meet all the expectations of the project. We would have liked to improve the nets of the playing field so that the balls won’t roll into the neighbor’s property or house. That was one of the goals that could not be met, but we hope that future projects will continue to be innovative and support the interests of Starfish. Ah, year end. That time where we all stop and reflect on the year behind us. At the Starfish Foundation it’s been amazing year – one full of achievements, laughter, learning moments, and growing relationships. We improved our strategies for our monthly leadership school for scholarship students! Our volunteers and educators helped guide our 2do bachillerato students (U.S. equivalent – high school juniors) in finishing their community service projects. One group worked with parents to improve communication in the neighborhood, while another visited Damien House, a facility for patients of Hansen’s disease. Another group of students finished up their community service project. After planning them throughout the year, the hard work finally paid off as they put their projects in motion. This group organized a literacy project where students delivered books and other educational materials so their parents could begin learning. We began our scholarship selection process for the next school year, beginning with an informational meeting for all. March is the end of our school year. Students presented final projects at Starfish where they were able to demonstrate the skills they learned at our new & improved classes over the past 5 months. The project was called “Around the World” and each group had to research, make a PowerPoint, and present to the class about a country they had never researched previously – and include a creative piece as well such as traditional dress, sharing a traditional food, etc. We went on a field trip to Bucay at the end of March for students with the best grades this past school year. Bucay was a lot of fun since it is at the edge of the mountains and is a much cooler climate than we are used to in hot & humid Guayaquil! 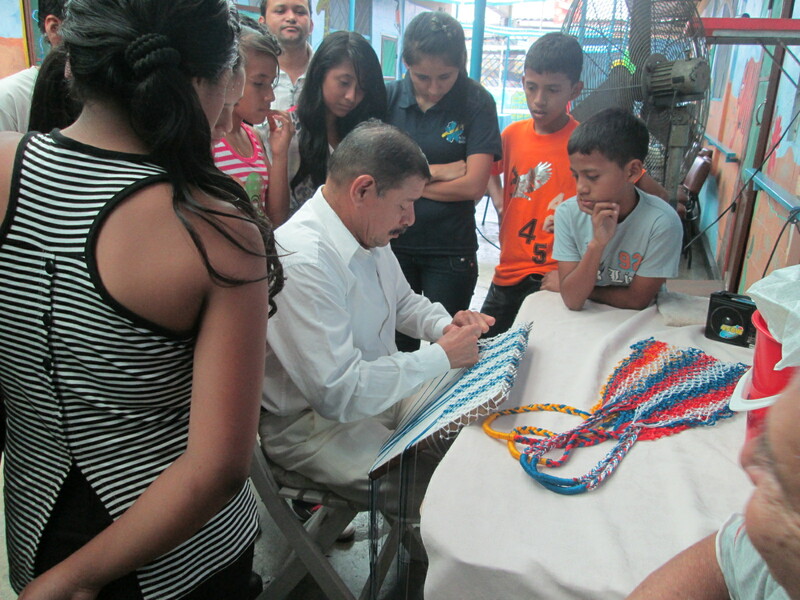 We also made some great progress with formalizing our organization in Ecuador. We received the equivalent of our EIN, and hired an accountant, Jazmin, to help with the required reporting to the Ecuadorian IRS (SRI). We implemented a new summer reading initiative! Starfish students were asked to read daily, complete a reading log, and attend weekly sessions to talk about what they were reading with our educators. The students who attended had a great time and we are excited to see their love for reading grow! School started on April 24th! We had 50 new students joining us in tutoring this year, with 140 students overall. We spent the first week getting to know each other, establishing classroom expectations for the year, reviewing material from last year, and setting goals for the year! The first week of May a small camp was held within the foundation where kids were taught about HIV in a fun way through ice-breakers, soccer and other games with the help from a visiting Peace Corps volunteer, Bonnie. Clubs started meeting: soccer, crafts, and community service! On May 12th, in celebration of Mother’s day, the students decided to share their love for their moms by going around and singing for them. “It was a very exciting moment for the moms, because they did not expect it and this way they could feel the affection that we all have for them,” said one participant. This month, our theme for our tutoring sessions was ecosystems. Our educators implemented new methodologies to help engage our students and motivate them to connect learning to real life. At the end of the month we even started our own garden at Starfish, that is still going strong today! In order to help in professional growth, we held a workshop with the psychologist entitled “Human Intelligence Development”, which was used to detect students’ abilities in the process of their development. This month’s tutoring them was, “how to carry out an academic investigation.” The students worked in pairs to do research about the provinces and capitals, tourist sites, and myths and legends of Ecuador. The last week in June the students presented their research through expositions that each pair created. On June 25th we celebrated fathers and father figures with a tribute to those who our students deemed “most important in their life.” This special celebration included games, questions, a blind baby food challenge, and a game of indoor soccer. It was a day filled with hugs, emotions and interactions between the students and their dads. This month also marked the arrival of our summer volunteers who led exciting new clubs including science and theater! Whew, what a busy year! And that’s only half of it! Tune in next week to see what else we got up to this year, as we reflect on July through December 2017 before turning over a new leaf and a new year. This past year, the Starfish Foundation served 150 students from 110 families offering supplemental learning sessions, tutoring, leadership development, and professional development, while encouraging healthy choices and community service. Starfish: Hey guys how are you? Can you introduce yourselves to the blog? Cristhian: My name is Cristhian Vega. I live in Flor de Bastión in Guayaquil. I’ve been attending Starfish since the beginning of the year. Starfish: Welcome to both of you. How did you hear about Starfish and decide to apply? Cristhian: Some of my friends around my house talked to me about this and that it helps a lot with school work. Starfish: That’s great. What sort of things do you work on and learn at the Foundation? Cristhian: We do workshops and they help us to complete tasks. I like the Foundation because we also do really cool activities. Emerson: As Cristhian said, the educators give us workshops that help us to learn more. The most interesting thing that I learned, I learned one day at the Foundation when the educations held a workshop on natural sciences. They talked a lot about animals and I liked that a lot. Starfish: And Cristhian, and what’s the most important or most interesting thing you learned this year? Cristhian: Something very important that I learned this year is math. I think it will help me in the future. Starfish: Absolutely. What do you guys enjoy doing when you’re not in school or at Starfish? Cristhian: In my free times, I love to ride my bike with my friends. We really like to race each other. And now that they fixed the streets a bit, we can ride a bit better. I also play on my dad’s cell phone. Emerson: I spend a lot of time studying; I like to learn things that I don’t already know and I also have to study for school exams. When I have free like to play soccer on the court near my house – that’s the best way to have fun in my community. Starfish: Sounds like you guys are smart cookies, and keeping yourselves busy! Thank you for meeting with us to answer a few questions! Are You Ready for Starfish Search?! In exactly one month the 2nd annual Starfish Search will be upon us! If you participated last year, you know that the Starfish Search is a time for you to gather your friends, embrace your creativity, and have a Ton. Of. Fun. while raising awareness (and funds) for the Starfish Foundation. This year we’re making a few changes to make this years hunt bigger, better, and bolder than ever before. We’re upgrading the hunt from 12 hours to 72 hours … that means you’ll have 6x as much time to complete items. The list will be published at 8am EST on the morning of October 28th. You will have until 8am EST on October 31st to complete and submit your tasks. More items! There will be more chances to express your creativity, more chances to do service for others, more smiles and laughs, and more opportunities to share your love for the Starfish Foundation. Ah, the memories we’ll make! Teams can now be compiled of members from around the world! That’s right – You don’t have to live in the same town (or even same country) as your teammates. So gather up your friends and family and see how well you can do! New prizes – Don’t have the time or energy to be super competitive and go all in? No worries! You can still win amazing prizes. Pick you favorite items and focus on making your submissions as thoughtful/creative/funny/impactful as possible, and you may be chosen for a special prize! Create your team. Find 1 – 4 other people who want to compete alongside you (from anywhere in the world), pick a team name, and sign up today. Make new friends! When you sign up, indicate that you don’t have a team and we’ll connect you with Starfish supporters and friends around the globe. So how does the whole thing work? Each team member will need to pay $20 per person (or $90 if registering five people at one time for a team). All members registered by October 14th will receive an official Starfish Foundation t-shirt (while supplies last) – you may be asked to wear this shirt throughout the hunt at various times. On the morning of the hunt, we’ll post a list (in English and Spanish) right here on our blog that will have a number of fun and weird tasks for you to complete – some will be about raising awareness, some will be about community service, some will be to learn more about Ecuador, and some will be just for fun or to test your creativity. Once you sign up, you’ll receive additional information and hints in the time leading up to the hunt. Team captains will receive instructions on how to submit items and tips for organizing their teams. How exciting is that?? We know this year is going to be even more awesome than last year (And that’s saying something), so go on… Get your friends and family in on what may be the most fun they’ll have this fall! Guest Blogger: Jane Lorenzi is a senior at Marquette University in Milwaukee, WI, studying International Affairs and Spanish. She has been part of the Starfish family since 2014 and has volunteered both in Ecuador and the United States. She has also spent time in Chile, Argentina, and the Dominican Republic and is fiercely passionate about justice issues in Latin America. I’ve come to realize that material things rarely, truly empower people. Rather, it is the intangible things, such as education, that garner the most transformation. Education does not create dependencies; it sustains and empowers, allowing women in particular to be independent. In a society where theft is a constant fear, education is a beacon of hope. What you learn in and outside of the classroom cannot be taken from you. Education is the catalyst for change, for development, for dreams that become realities, for peace. Education allows individuals to empower themselves. With knowledge, they can make informed choices — about their health, about their relationships, about their futures. And it is perhaps the greatest hope that this knowledge will translate to understanding and tolerance, which in turn will work to create a more peaceful, just, compassionate world. A world in which every human being is given the opportunity to grow and evolve and improve and empower himself/herself and others, where every person is treated with dignity, respect, and love. That’s what makes Starfish so cool. It empowers its students to become leaders in their communities by supporting their academic needs. Focusing on education is a grass-roots approach, which puts power in the hands of locals who more fully understand the complex nature of the injustices that exist in their own communities. That is not to say simply going to school will fix all the problems. The education system in Ecuador is broken in countless ways (I’ve yet to hear a positive anecdote about the Ministry of Education). Poorly trained teachers, ill-equipped classrooms, and relatively ineffective curriculum based mainly on rote memorization can deter children from being passionate about learning and/or interested in going to school. It’s often hard to explain to the students how important education is when their school day is more or less miserable and boring. There are rays of hope though — that despite broken systems, going to school is definitely not all for naught. That education really does ignite change. Like when Mikey beams about how much he loves English class and practicing his English with us volunteers. Or when Cristhian talks about his passion for the sciences, biology especially, and how he doesn’t need help with science homework because he understands it. Or when Maria Belén, one of Starfish’s first students to graduate high school, attends university to study medicine, pursuing her lifelong dream of becoming a pediatrician. These remarkable students represent the beginnings of a new generation: a generation of passionate, inspired leaders and doers and shakers. That sounds like a pretty beautiful future to me. A future that Starfish is shaping, poco a poco. American historian Laurel Ulrich once said, “Well-behaved women rarely make history.” In celebration of Women’s History Month, here are a few of the millions of brave women that have broken all conventional rules to make a difference in the world. Born in 1936, she began to dance in 1945 in Guayaquil. In 1957 she traveled to London to perfect her skill at The Royal Ballet. Throughout her career she dances in London, Paris, Ecuador, and Cuba – excelling in both Ballet and Modern. In 1978, Vera founded her own ballet company and academy in her home city. After retiring from active dancing, Vera worked as a diplomat in Mexico and Cuba. As an actress, she is most well-known as the lead actor in the 2012 Academy Award winning film Curfew and its 2014 full-length feature film version Before I Disappear. She has also been the voice of “Dora” in Nickelodeon’s animated television series Dora the Explorer since 2010. As a UN activist, she has played an active role in the #HeForShe campaign for gender equality. She is currently 16 years old, fluent in Spanish, English and Mandarin, and has expressed interest in transitioning from acting to a career in law someday. Alicia is one of the leading figures in Ecuadorian literature and in Latin America, and she is the first Ecuadorian to win the Premio Sor Juana Inés de la Cruz, which she received in 1996. Born in 1928 and raised in Quito she had “an extremely happy childhood, maybe a bit boyish, influenced by the first books I read: the works of Julio Verne and Tarzan’s feats.” Male chauvinism is a recurring theme in her writing. Irony, sarcasm and hyperbole make evident twisted masculine superiority and she often critiques social concepts such as virginity and homosexuality. One of her more famous novels is “El Cristo Feo” (“The Ugly Christ”). In 1996 she received the Premio Sor Juana Inés de la Cruz for the best Latin American novel written by a woman. While I could write on and on about these women and others, I instead encourage you to look into your own female role models and learn more about the contributions they have made to society – past or present. And, as always, be sure to remember the women who are close to you – teachers, principals, businesswomen – who have encouraged you to find your voice, helped you overcome obstacles, or challenged you to think differently. Earlier this week, the Starfish Foundation celebrated it’s 5th birthday! That’s five years of providing scholarship, tutoring, and leadership development to youth living in extreme poverty in Guayaquil, Ecuador. Over that time frame, Starfish has grown and grown – and currently serves over 120 scholars in Guasmo and Flor de Bastion. The idea for the Starfish Foundation developed after co-founders Beth and Jenn volunteered for a year in Ecuador, where they volunteered at a shelter for former street kids. A lot of these kids had no family or little support at home. Though many of them had the motivation to study, they lacked financial resources to be able to attend school once leaving the shelter. Though public schools in Ecuador are free, families often still struggle to provide all the necessary materials (uniforms, books, school supplies, etc) while living on minimum wage and trying to feed a whole family. For many, the easiest solution was to not go to school. The Starfish Foundation works to fill a need that focuses on the importance of education as a catalyst for future success of each student and their communities, and provides scholarships and mentoring to students in financial need who have the motivation to continue their studies despite challenging circumstances. But the success comes not just from funding scholars, but also seeing bright, caring, thoughtful individuals find the means to achieve their goals. It’s about seeing faces light up with smiles. It’s about promoting confidence through talent shows and interviews. It’s about creating a sense of community through outreach. It’s about improving our environment by encouraging sustainable living and recycling. It’s about service and instilling the values of hard work and giving back to the community in our scholars. It’s about big dreams, and big plans, and big ideas. It’s about giving every scholar the boost they need to be the best version of themselves. On the trip last year, there was a moment when we got together all the “original” Starfish Scholars. It was kind of like the end of A League of Their Own – very nostalgic to remember back those early days, but impressive to see how these young adults (now) have grown up and are now giving back to Starfish as employees or volunteers! Bringing my parents and best friend (basically my sister, in Spanish they call her my ñaña) to see Starfish. They are SO supportive and it was so special to have them meet our Scholars and their families! The experience of growing our Board this fall. It was really the first time we had done anything quite like this – but the interviews with so many WONDERFUL people were delightful. I have loved getting to know our new members and seeing their positive energy. They have already started to give back in so many extraordinary ways! Putting together a robust U.S. Operations team. We’re well on our way to doing so – an amazing set of Managers / Advisers for Development, Communications, and Volunteer Management, efficient Admin team of our Sr. Admin Assistant, Accountant, and Tech Guru, and an amazing team of Social Media interns. We have work to do, though, in creating the best structure to maximize capacity and efficiency – and I’d love to see us get to a great point with that. Officially registering in Ecuador, buying land, and building our dream “house.” It’s the longest, most complicated process EVER, but we are nearing the end, and that’s pretty incredible. Seeing the amount of people who learn about Starfish continue to increase! I hope you can agree it’s been an incredible Journey, and yet an even more amazing one awaits us. I also hope you’ll join me in wishing Starfish a very warm and loving HAPPY BIRTHDAY. This past week a group of Starfish students (Scholars and non-scholarship students) visited another organization here in Guayaquil as part of our Leadership Development (formally community service) program. The organization we visited, Damien House, is a charitable hospital and clinic that transforms the lives of patients with Hansen’s Disease. Hansen’s disease (formally known as leprosy) is now completely curable – but unfortunately it’s past stigma means that many patients are cast out of their families and society. Damien House provides them with a place to live with dignity, and die with dignity. Many younger patients who have undergone the treatment have now returned to their families and lead completely normal lives. Damien House provides care to the patients, but also receives many groups like ours throughout the year in hopes to continue to the spread awareness about Hansen’s Disease. Our students first received a tour and a talk about how the organization began, as well as a talk on what is Hansen’s. Then we had a chance to spend the rest of the day with the patients, getting to know them and assisting in their daily lives. In the men’s section the students were fascinated by one man who makes string bags, while another group of students spent hours playing dominos. Gathered around, watching the master at work! In the women’s section, the students spent a lot of time talking. The patients loved hearing about Starfish, as much as we loved hearing about their lives. This is important as many patients don’t receive a lot of visitors. One lady was working on her bracelets, when Starfish Scholar Pamela shared that she also makes bracelets. Pamela taught Esther how to make names with string on a pen while Esther showed her many new ways of bracelet making. All in all it was a great day. Due to the size of our group and the organization we’ve broken into 3 groups. This Saturday it’s group number 2’s turn! 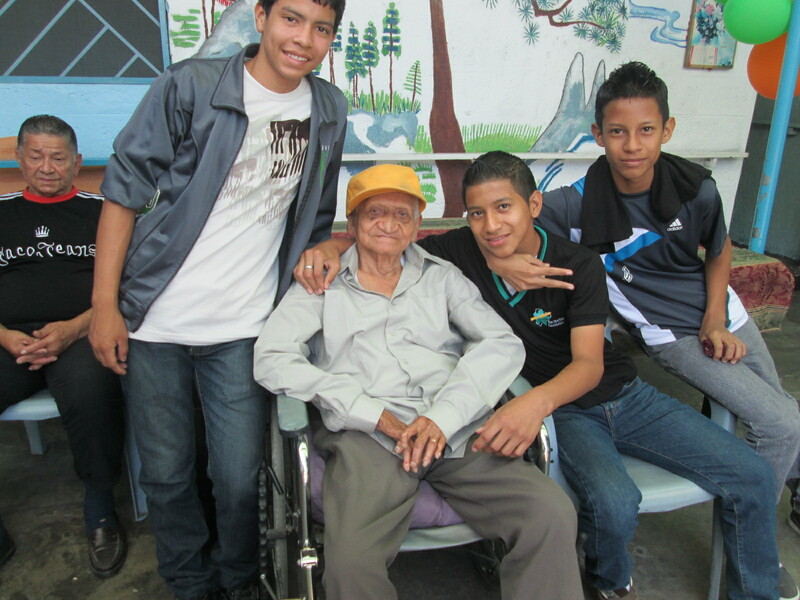 Joel, center in the Starfish shirt, was a great leader in starting conversation and really getting to know the patients!